Although I've worn this romper a few times, this was the first time we were able to get photos. Southern bloggers, I applaud you for getting fab photos without the camera lens fogging up! It took us a few tries, but I am glad we finally privailed. What really drew me to this romper was the crossover top and tie which provides waist definition and the longer shorts length. That with the neutral colors make it chic and sophisticated. 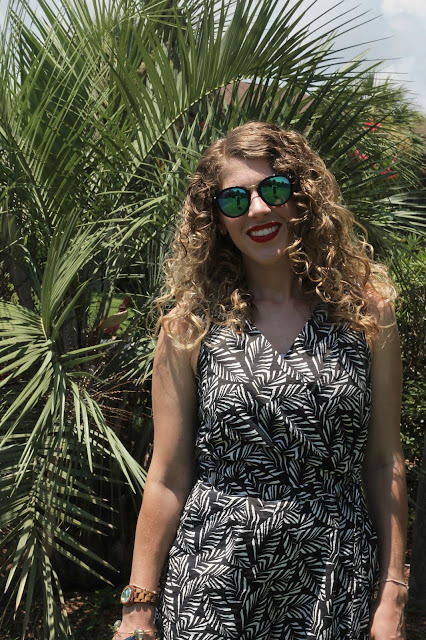 These sunglasses and my others from Sammydress have been so useful! For between $3-$8 I don't care if they get splash, set on the ground, or fall off when I put them up on my head. At the same time they provide great shade for my eyes. My wedges have been another great staple. I wore them all day at the Georgia aquarium they are so comfortable! I am not sure if any of you noticed, but typically I link to two similar items for each piece of my outfits. Often times I just choose the most budget friendly ones. In the last few posts I have changed that and linked to a 'SAVE' item which is less expensive and 'SPLURGE' item which is pricier. I don't know if it makes much of a difference because I don't think many of you use those links, but I would love your thoughts! Should I continue with a 'save' and 'splurge' option or go back to just linking to 'similar' items? This romper is so cute, love the print. Love the romper. The trick for less camera fog for me, is early morning pictures. Bei in fl humidity is awful. And the heat makes it hard so early morning for me or late in the day. You look amazing. I link a lot to splurge and steal nothing wrong with it. I love the print of your romper! You look so cute! I love seeing save/splurge options! 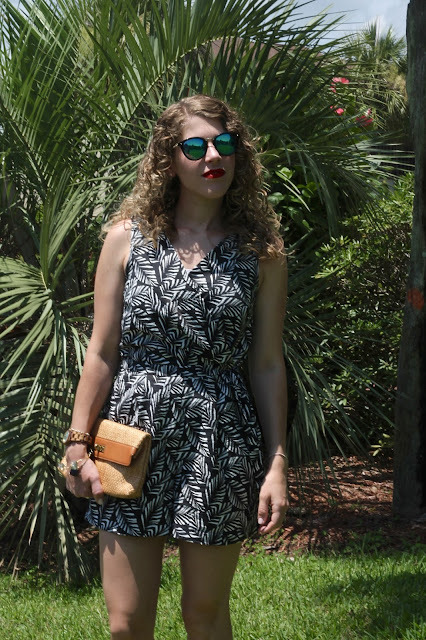 I've been loving the palm prints everywhere this year! And this romper looks so cute on you! Love it! Love a good romper- and this palm print is perfect for summer! Hope you're having a blast on your vacay, lady! Rompers are such staples for the Summer. I LOVE yours. Perfectly styled. Great look Laura! That romper is so cute! I think these will be a summer staple for me. Those sunglasses are cute too! Love this romper! It's cute and I love the palm print. The b/w palm romper is SO pretty on you! I have had problems with my lens fogging up before and it can be frustrating! How funny the issues with taking photography in the humidity---every day is a learning process, no? I really like this romper...it almost looks like a dress. But more appropriate for certain events!! Such a cute romper. I love the idea of Save and Splurge. I click on the link when I really love the clothing item and want to buy one. I love the print on the romper. I like the idea of save/splurge. Cute romper! I like splurge/save posts! What a perfect, summery romper. And how funny about the humidity fogging up the camera! (Well, not exactly funny when you're trying to take pictures, but stuff I've never thought about on the West Coast!) I personally like the Splurge/Save designations if you're listing multiple "similar" options. I think it's more helpful that way. That is the cutest romper. Love the palm print. I like save vs. splurge options. I think a save and splurge option is a great idea too, although I'm trying to stay away from all options doing #noBuyJuly16, haha! Love this romper. It's such a cute print!! Looking beautiful in this romper. What a fun romper, I love the print! I've been having lens fogging issues too... so annoying. I do use and appreciate when bloggers link to the same or similar items--if it's something I would consider purchasing myself I'm happy to give that blogger "credit" for it! I'm a budget shopper all the way, so I wouldn't likely use the "splurge" option, but as long as there's an affordable option I like either way. What a great romper, so perfect for summer!